No need to worry about changeable Irish weather! Designed by former international tennis player Annette Smith. Small classes means your child will learn with fun and excitement of the real thing. Great way for pupils to experience camaraderie, cooperation and confidence. Easter, Summer, Christmas and Mid-term Sorted. Give your child a love of tennis during the holidays. Take a minute, browse and shop for specialised equipment for children’s tennis. 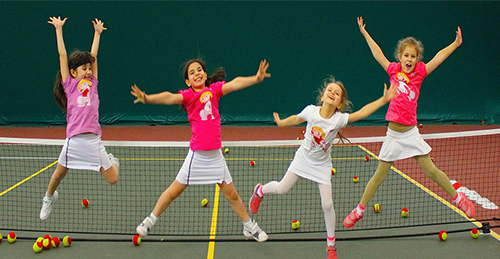 Tennis4kids is a uniquely designed tennis programme for children aged between 5 and 12. Children of all abilities and levels of co-ordination will fall in love with tennis in a safe, supportive setting. Smaller courts, softer balls and perfect-sized rackets for smaller hands mean children can develop at their own pace, having fun in an enjoyable environment. Our committed coaching team get to know their players and allow them to grow in confidence. Playing tennis on smaller courts using slower balls, children progress easily and quickly, even if they've never played before. Anyone for Tennis Summer Camps?